Combine the music montages of "Glee" with a funny, female cast like that of "Bridesmaids," and you've got the upcoming big-screen comedy "Pitch Perfect." Anna Kendrick, of the "Twilight" flicks and an Oscar nominee for her performance in 2009's "Up in the Air," stars as Becca, a misfit college student who, unhappy with her life at school, joins an a cappella group. She leads the women in ditching their traditional numbers for mash-ups of songs old and new as they compete in the cut-throat world of college a cappella groups. Actresses Rebel Wilson, who played Kristen Wiig's hilarious British roommate in "Bridesmaids," and Brittany Snow from "American Dreams," also star. While the flick won't hit theaters until October 5, omg! has an exclusive first look at the movie poster, which shows the co-eds rocking shades and looking as confident as if they'd just won their 10th Grammy Award. From left to right, the poster shows Wilson; singer and voice-over actress Ester Dean; "The Help's" Anna Camp; Alexis Knapp, who had a baby with former boyfriend Ryan Phillippe in July; Kendrick; Snow; and newcomer Hana Mae Lee. Not pictured on the poster is funny lady Elizabeth Banks, who serves as a producer on the film. (Interestingly enough, she earned her first producer credit working on Bruce Willis' 2009 sci-fi thriller "Surrogates.") Banks, fresh off starring as the villainous Effie in the blockbuster "The Hunger Games," spoke about "Pitch Perfect's" ensemble cast last year. "We're definitely catching our actors at such amazing points in their career. I liken it to when I did 'Wet Hot American Summer,'" she told Entertainment Weekly, referencing the 2001 cult flick that she made with Paul Rudd, Amy Poehler, Bradley Cooper, Molly Shannon, and more. "As a young actor, this is the exact type of movie you want to do. It's like going to camp with a bunch of your friends and making each other laugh, and singing and dancing. There's nothing better than that." The finished product, Banks said, will be a fun movie musical. "You could compare it to 'Rock of Ages.' You could compare it to 'Mamma Mia!,' because it's being made by the same studio [Universal Pictures]," she told the magazine. "Yes, there is some singing and dancing in our movie. But essentially, we're making a coming of age comedy — a very classic tale." 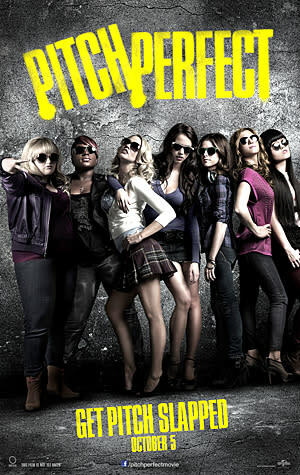 Are you excited to see "Pitch Perfect"? Check out the movie's trailer when it premieres exclusively on Yahoo! Movies on Thursday, June 14, at 7 p.m. ET/4 p.m. PT.